George Morrison Carstairs, was born in Mussoorie, India on 18th June 1916 where his father the Reverend Doctor George Carstairs was a Church of Scotland missionary. James Keddie in his excellent centenary history of the SAAA refers to him as Morris but many others use his first name of George while the gbrathletics website calls him Morrison ‘Jack’ Carstairs . For the sake of convenience he will be referred to here as Carstairs! He was educated at George Watson’s College and Edinburgh University. When he had completed his running career, Carstairs had a brilliant academic career in Medicine and Psychiatry and became Professor of Psychiatry at Edinburgh University from 1961 to 1973, Vice Chancellor of York University from 1974 to 1978, and between 1969 and 1971 was President of the World Federation for Mental Health. He gave the Reith lectures in 1962 (accessible via youtube), and wrote many academic papers. The SAAA standard distance up to 1934 was the Four Miles but in that year they changed it to the Three Miles and Carstairs was the outstanding Scottish runner at that distance until the War started in 1939. He ran well in 1936 winning the Mile by 50 yards in 4:31,1 running for Atalanta against Aberdeen University. On 15th May 1937 he started his season with a victory in the UAU Championships. The ‘Glasgow Herald’ said: GM Carstairs, of Edinburgh University established one of five new records set at the Universities Athletic Union Championhips at White City, London, yesterday. 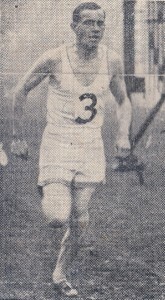 With a time of 14 min 36 4-5th sec, Carstairs was a comfortable winner in the three miles event, taking the lead at the end of the first mile-and-a-half and maintaining it right to the finish.” Eleven days later at Craiglockhart in Edinburgh he won by three yards from his local rival Jack Laidlaw in 14:50.8. Laidlaw, who had won the SAAA title himself in 1935 in 14:46.4, had the upper hand next time they met, also in Edinburgh, on 8th July. Carstairs time was 14:39.5 to Laidlaw’s 14:37.5. Carstairs went on to win the SAAA title at the distance in in 14:35.6 and in the same year was second in the World University Games. The Glasgow Herald reported on the SAAA race as follows: “Indications that GM Carstairs would not be strong enough to stall off Laidlaw, Gifford and Farrell in the Three Miles proved quite groundless. The Edinburgh student, who holds the titles and the records for British and Scottish Universities, set out – very wisely – to set a pace that proved beyond the powers of his rivals and he succeeded beyond expectations. Selected for the Triangular International in Dublin that year he ran 14:29.8 on a grass track in heavy rain, a time that was 17 seconds inside the Irish record. The photograph below shows him during the race. His best single year was probably 1938. In the Inter-University contest on 7th May at St Andrews he won the Three Miles in 14:39 to start the season well. He then stepped down a distance or two to win the half mile at Craiglockhart on 12th May also against St Andrew’s in 1:59. 8. On May 21st, he retained his UAU Three Miles title at the White City in 14:53. On 11th June in the Inter-Universities Tests at Aberdeen, he was second to JAM Robertson in the half-mile after leading most of the way: Robertson’s time was 2:09. In the Three Miles later at the same meeting he won in the slow time of 15:20.5 to ‘make amends for his failure in the half mile’ . On 18th June he raced a hard half-mile where after leading for most of the race finished fourth, after leading virtually to the home straight. He repeated his SAAA victory in the Three Miles on 25th June, again at Hampden Park in Glasgow, this time in 14:40.9 . The Glasgow Herald reported: Expectations of challenges and counter-challenges in the Three Miles were realised for half the distance when PJ Allwell and JP Laidlaw endeavoured to out-manoeuvre GM Carstairs, Edinburgh University. Neither of his rivals, however, had the pace to equal the champion and when he applied pressure in the third mile, he soon disposed of his challengers. Running on strongly on his own, he won by 150 yards in excellent time indeed, when the force of the wind in the home straight against him is considered.” Three weeks later at the White City, Carstairs ran for the only time in his career at the AAA’s Championships. The ‘Glasgow Herald’ report read: “The best race of the meeting was the Three Miles in which GM Carstairs, the Scottish champion, made a valiant attempt to win. In the last lap, Carstairs had not the pace to last, but he clocked the fastest time of his career, approximately 14 min 26 secs.” Fourth finisher, but how close was he? Well, the winner was CAJ Emery in 14:21. This running was good enough to see him selected to run for Great Britain three times that year, winning v Norway at White City over 5000m (14:58.4), 2nd v France at same venue on August 13th behind CAJ Emery over 3 miles (14:45.8), and 6th at the European Championships 5000m on September 5th at Paris (14:51.3), where the ‘Glasgow Herald’merely said “Sixth place in the 5000m went to GM Carstairs, the Scottish Three Miles champion.” The only Briton ahead of him was CAJ Emery in 14:46 in fourth place. Two weeks later, the German troops occupied the Sudetenland, and the Herald tells us the occupation went smoothly. The possibility of war was discussed at great length throughout the papers, even the women’s page of the paper by Ann Adams made frequent reference to it, the letters pages were almost single-topic and Air Raid Precautions were being printed. Nevertheless the Victoria Park McAndrew Relay was held on October 1st and Bellahouston Harriers won from Shettleston Harriers and Plebeian Harriers. Runners prepared for the next year – they could do little else – and Carstairs was heading for his biggest title win in 1939. Right at the start of 1939’s athletics season, Germany and Italy upgraded the Axis into a military alliance. If ever a season started with an indication of its relative importance in the world, this was it. In athletics, GM Carstairs began in on 13th May in the annual Edinburgh University v St Andrews by winning the half-mile in 1:59.8 and on 27th May he retained the Three Miles title at EUAC sports in a new record time. On 10th June, he ‘deserted’ the Three Miles in the Edinburgh v Glasgow University match to win both half mile and mile. The ‘Glasgow Herald’ was fulsome in its praise of the Edinburgh man. “Most thrilling of all was the half mile, in which JAM Robertson was expected to retain against Carstairs. In the first lap, JA McGlone, Glasgow, made the pace and down the back straight Carstairs took up the running. Robertson was obliged to make his effort to pass the Edinburgh leader on the bend, and he overhauled him with 70 yards to go. From that point the struggle was tense; it seemed that Robertson would prevail but he had run himself out, and Carstairs, making a desperate lunge in the last stride, won with only inches to spare. Carstairs was the athlete of the meeting, following up this splendid win by dethroning another champion, J Muir, in the Mile. The Glasgow runner’s policy was to race all the way and he got clear of his rival before the bell, but Carstairs finished stronger to set up a record of 4 min 25.5 sec – excellent under the conditions.” So Carstairs was clearly in good form going in to the championships. He was winner of the SAAA Three Miles for the third successive year, this time in 14:41.2, but no comment on it appeared in the Glasgow Herald report on the meeting but the results indicate that he won by 60 yards from Tommy Lamb of Bellahouston Harriers with another from Bellahouston Harriers, SA Kennedy, third. Carstairs also won two titles at the UAU Championships – the Mile and in the Three Miles. His big moment that year, however, had to be winning the World University Games 5000m title in 14:51.3. The SAAA race had been at the end of June and after the team for the games had been selected, there was a ‘try-out’ for the Scottish athletes on Monday 14th August and the report said that “GM Carstairs in the 5000m men’s race finished in better time than has previously recorded at the World Games.” His winning time was 15:13. Came the Games themselves on 30th August, his time was slower at 15:20.2 but it was good enough to win the gold. Unfortunately the political situation was such that there was very little in the way of reporting on sport – the Games started on 30th August which was when the surge to war was reaching a crescendo and the papers were full of the arguments between countries (complete with maps), suggestions for those at home with regard to economising and making the most of rations, the sinking of the Athenia and so on. He is recorded as having two races at his specialist distance in 1940 – Carstairs ran 15:15.6 at Craiglockhart on May 15th, and 15:17.3 at Glasgow, in the Inter-Universities Championship on June 8th, where he won the Three Miles by 150 yards as well as the Mile in 4:32.5 where the margin was 35 yards. However, his career, like that of most athletes at the time, was effectively over. Many athletes saw their best years missed due to the War, but Carstairs was only 23 when the shooting began and had his last two competitive years over shadowed by the lead in to the hostilities. The obvious but ultimately futile question of what he might have done could be asked but it is certain that unlike many a top class athlete, he derived tremendous satisfaction from a brilliant medical psychiatric career subsequently. You can hear him delivering the 1962 Reith lecture on ‘The Vicissitudes of Adolescence’ here http://www.bbc.co.uk/programmes/p00hbdb5 and several of his papers are available on the internet. He died in Edinburgh on 17th April 1981.